Say goodnight to those midnight diaper changes! HUGGIES Overnites diapers are their most absorbent overnight diaper to help eliminate leaks, offering up to 12 hours of protection for your baby. HUGGIES LEAK LOCK* design in our nighttime diaper keeps wetness where it belongs until dawn to help maintain healthy skin. 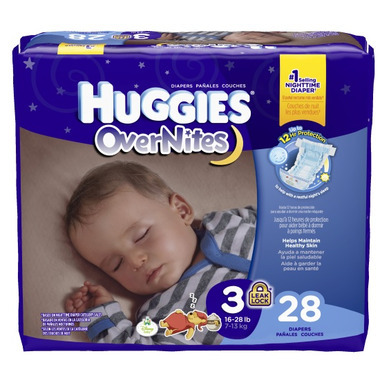 HUGGIES Overnites are a simple way to help everybody get a better night sleep. LEAK LOCK* design keeps wetness where it belongs and helps maintain healthy skin. HUGGIES overnight diapers have the SnugFit* waistband and unique tabs for a secure fit. Adorable graphics, featuring Sleepy Winnie the Pooh Disney designs. awesome diapers. These are my go to for my munchkin .